Traveling – the right way! A life is rare, beautiful and precious. More so is a human life (bit narcissistic?). I just got back from a weekend hike up the Mt.Washington, NH, known for one of the worst, unpredictable, rapidly changing weather conditions owing to its topography and altitude. I was fortunate (tad bit disappointed) that I had clear skies, pleasant winds and warm weather throughout the hike. Of course I picked the right time after making sure of the summit forecast. The visitor center at the summit has a placard with a list of human lives lost hiking or skiing the mountain. At least a few every year. The stats are scary. People die of hypothermia, cardiac arrest, avalanche, crushed bones after a 60 feet fall on the rocks etc. I was just thinking of this fellow hiker who was walking past me nonchalantly bragging about the first time he hiked the same mountain in 1968 when he was 14 years. When I was climbing Mt. Marcy with this seasoned hiker friend, I got to hear him and a ranger talk about a bone chilling (literally) incident during last winter when a woman hiking up the mountain losing her fingers to frostbite. These stats are not concealed. Everyone who is hiking the mountain is aware of the stats. That doesn’t stop any of them from risking their life. In fact that is even more the reason to attempt the feat. Just read the news about Harry Dervert, New Yorker, a world traveler and true lover of life who met his untimely death at 32 on his new (and last) venture to go on a motorcycle across the Americas while in a drug cartel region in Mexico. Makes me sad and proud at the same time. He must have known it is dangerous before he even started but that ain’t gonna stop him. People die climbing Mt.Everest all the time from the day it was discovered as the highest peak. A lot of bodies were just never recovered, fated to be in icy tombs. Some just dare to go up with no supplemental oxygen as it is looked down upon in the climbing community. It is not uncommon to find dead bodies while climbing up. 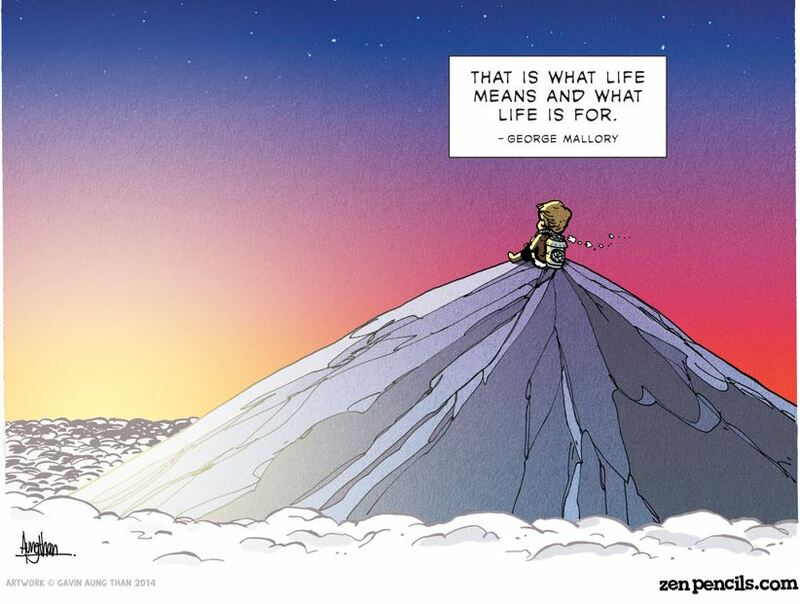 George Mallory who was part of one of the earliest British expeditions was lost in the mountains in 1924 and it took 75 years to find his remains. Rob Hall, one of the lead guide of the 1996 disaster expedition succumbed to a blizzard and his body is up there to this day. Ever wondered what pushes people for these ventures? They know things can and will screw up and life can just end in a matter of seconds. The prospect of facing death doesn’t make them flinch, they would rather smile at the face of death. They all had a choice. They could have taken the easier road, lived a longer life to a happy retirement, but they just couldn’t. If they were given a second chance in life I’m pretty sure they would all make the same life choices again with no regrets whatsoever. So what is it that drives their lives? Some might think it is the fame or glory but may be it isn’t. A lot of them just die trying though they are aware that the odds aren’t great. They would still be happier going down trying. The legend is that George Mallory was asked “Why do you want to climb Mt.Everest”, and he replied “Because it’s there”. Some things cannot be explained or reasoned. There is that thing in a man which responds to a challenge for the sheer joy of adventure. Some people just love life too much that they think it’s worth dying for. Edit (After watching Everest movie): Yasuko Namba – The Japanese woman in the elite list of seven summit climbers met her fate in her final summit climb of Mt. Everest in the 1996 expedition. The cinematography and casting is so perfect I could feel the triumph and the fulfillment of life when one finally quench their thirst for a dream summit climb. I felt my heart racing, I felt the adrenaline rush, I felt being at the top of the world. And to think this was all from my two hours of experience before an IMAX screen I cannot possibly extrapolate the experience of being up there for real. And then when Yasuko succumbed to the cold, unable to make a safe descent and just curled up right there, I was sad at first but then may be that was a death she probably always wanted. Loving something so passionately and let it kill you. I don’t believe in God and creation but say I did – it was as if she was sent to the Earth on a mission and that it was the only thing she wanted and the only thing she lived for and now that she is done she just gave herself to the mountains and let the Everest keep her forever in her lap to rest in peace. New item to the bucket list: Though I do not have the steel balls to attempt an Everest climb I should at least hike up to the Everest base camp and sip a cup of coffee with some real heroes. Scary.. The information you have provided, congrats for travelling to such a place. I like the way you have add quotations at right places in this article.I like the writing pattern as well, in small paragraphs, and well written. Strange that your passion becomes so important that its worth dying if required.I wish I have the guts to even think that way. I dint get the end of it. See sometimes if people love life too much and realize the importance of their limited time on the earth they will go to any extent to make it worthwhile. They have a choice of a less risky regular long life or a life that interests them which makes them feel having lived a fuller content life but comes with a risk factor that it can end anytime. When the hunger is just too much they just go to any extent to satiate it that sometimes they are even ready to die in pursuit of whatever they were looking for and they would happily die trying than not to have tried at all for the fear of death. Thank you. A truly inspiring article sir! Words fail to describe how much this article resonates with me yet so humbling, for i have neither the courage nor the will. Thank you. That means so much to me! Vagabond Tales on Traveling – the right way!